Professor Jones’ research interests center in the study of public policy processes, American governing institutions, and the connection between human decision-making and organizational behavior. With Frank Baumgartner of the University of North Carolina and John Wilkerson of the University of Washington, Jones directs the Policy Agendas Project, now housed at the University of Texas. The project is the major resource for examining changes in public policy processes in American national institutions. The project is the model for similar projects in Denmark, France, the United Kingdom, the Netherlands, Spain, Switzerland, Italy, Canada, and the State of Pennsylvania. Jones has received National Science Foundation Grants totaling more than $2,650,000, and has published articles in the American Political Science Review, the Journal of Politics, the American Journal of Political Science, Policy Studies Journal, and many other professional journals. He has served on the editorial boards of the American Journal of Political Science, the Journal of Politics, Economic Development Quarterly, Governance, Political Psychology, and State and Local Government Review. He has served as President and Vice President of the Midwest Political Science Association, the Executive Council of the American Political Science Association, and President of the APSA’s Organized Section on Urban Politics. In 2003 Jones won the Herbert A. Simon Award for Contributions to the Study of Public Administration. Before joining the Department of Government in 2008, Professor Jones was the Donald R. Matthews Distinguished Professor of American Politics at the University of Washington. Previously, he was Distinguished Professor and Department Head at Texas A&M University, and also taught at Wayne State University and the University of Houston. 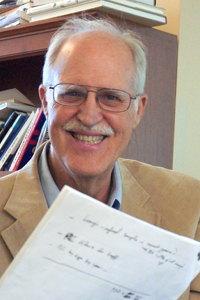 Jones’ books include Politics and the Architecture of Choice (2001) and Reconceiving Decision-Making in Democratic Politics (1994), both winners of the APSA Political Psychology Section Robert Lane Award; The Politics of Attention (co-authored with Frank Baumgartner, 2005); Agendas and Instability in American Politics (co-authored with Frank Baumgartner, 1993), winner of the 2001 Aaron Wildavsky Award for Enduring Contribution to the Study of Public Policy of the American Political Science Association’s Public Policy Section and The Politics of Bad Ideas (co-authored with Walt Williams). Timothy Conlan, Paul Posner, and David Beam. Pathways of Power. Elaine C. Kamarck, How Change Happens—Or Doesn’t. This course will examine the politics and history of public policymaking in America. We will examine how policy is made, and whether LBJ’s dicta that “good policy is good politics” holds. We will study contemporary policy challenges, the problems facing America, and the historical and contemporary development of polcies directed at those problems. We will focus on such matters as financial and budgetary challenges, health care, income inequality, education, environment, and justice. Since good policies can only come about with good information, properly interpreted, the course will emphasize the roles of ideas and information in the policy process: how elected and appointed political leaders use it to formulate and implement public policies. This Year’s Theme: Getting Policy Done in a time of Dysfunctional Politics. Given the bad press the US political system receives these days, this course will explore how policy gets made—or does not get made—in our current political configuration. Getting things done does NOT mean “productivity” measures like how many statutes are passed. Good policies DOES mean BOTH addressing important collective problems AND avoiding action when it is neither needed nor desirable. * Survey the approaches used by political scientists to understand the public policymaking process. * Integrate current public affairs into our understanding of public policy. * Survey the use, history, and success of the major tools used by governments in the US to address policy problems in several major issue areas. * Further the development of analytical skills in policy analysis through brief exercises and a major paper employing library and web-based sources. Students will use the Policy Agendas Project's datasets located at the University of Texas to trace public policy activity across time. Course grades will be based on a major exam, a paper in which students study a specific public policy and analyze its historical development, current status, and offer potential recommendations that incorporate both the desirable and the practical; and regular weekly quizzes and exercises. The question of how an issue gets on the policymaking agenda—that is, is considered seriously by policymakers—seems simple, but the most obvious explanations are questionable. It is not easy to explain what, how, and when an issue will come to prominence in a political system. This seminar will explore the notion that individual choices, choices within political institutions and public policy outputs are interconnected, but that the connections are not simple. We will examine the processes of how people and policy-making institutions process information and make choices, and how those choices lead to change in public policy outputs. We also study the process historically, to examine whether agenda-setting has changed over the years. This research course is the second half of a year-long research program under the direction of Professors Theriault (ST) and Jones (BJ). This term will be devoted to pursuing your individual research projects and continuing with your work as research assistants. Successful completion of GOV 370M and the permission of the instructors. The class will meet regularly to discuss progress on your projects and research assignments. We will also cover certain essential elements in design, analysis, and presentation of results. It is the student’s responsibility to come to class with all of the assigned work – both research and reading – completed. Rarely will the class stray from a seminar format. 10% Class Participation. We will take attendance every class meeting. Because of the nature of the course, unexcused student absences will not be tolerated. We frown on issues of academic dishonesty and will severely punish any student caught plagiarizing, cheating, fabricating data, or engaged in unethical classroom practices. All grade disputes must be type written and turned in within 1 week of receiving the grade. Assigned readings associated with design, analysis, and presentation. Readings associated with your specific project; we will design the reading program for each student. This course focuses on political science research about policy processes. It will involve an exploration of the major theories of policy change, and will examine important empirical contributions to the field. The course will examine the micro-foundations of policy dynamics (models of decision-making), and explore policy agendas, the formation of public policies, and factors influencing agenda and policy change over time. While the course will focus primarily on the American politics literature, we will also examine policy processes in comparative perspective. The course will include working with the Policy Agendas datasets, now located at the University of Texas (policyagendas.org), and an introduction to the comparative policy agendas projects, now underway in nine European countries. (4) corganization and class participation (20%). Paul Sabatier, ed. 2007. Theories of the Policy Process. Boulder, CO: Westview Press, Second Edition. Kevin Smith and Christopher Larimer. 2009 The Public Policy Theory Primer. Westview Press. And others to be determined later. This course will examine the politics and history of public policymaking in America. We will examine how policy is made, and study contemporary policy challenges, especially focusing on financial and budgetary challenges, and health care. We will also examine education, environment, and justice. First and foremost, acquire and read the assigned material. Second, attend class! Attendance will be monitored and will influence grades. Two Exercises (10% each)- These will be short papers (2-3 pages), based on the Policy Agendas Datasets. The datasets are located at http://www.policyagendas.org. Policy Paper (20%)- The paper will ask you to use the analytic skills that you are learning in the course to study the course of policy development in a major policy area. You will develop a policy history (including using the resources of the Policy Agendas Project), analyze the current implementation arrangements (if any), and make policy recommendations (if you wish). REMEMBER John Adams! * Carter A. Wilson, Public Policy: Continuity and Change. This research course is the first half of a year-long research program under the direction of Professors Bryan Jones and Sean Theriault. Throughout the year, we have two major goals. First, and less important, we aim to familiarize the students with our own research agendas (past and present). Second, and more important, we will introduce the students to the research experience. In this sense, the class will attempt to replicate the “laboratory” of the hard sciences. In those laboratories, students are engaged in independent, though related projects. Their work is coordinated and synthesized by a principal investigator who uses the independent projects to form a greater whole. This course is a social science laboratory. To that end, your work is synthesized by two principal investigators engaged in comprehensive research projects on the legislative and policy processes. The class will meet regularly to discuss the two major course objectives. It is the student’s responsibility to come to class with all of the assigned work – both research and reading – completed. Rarely will the class stray from a seminar format. Baumgartner, Frank R., and Bryan D. Jones. 2009. Agendas and Instability in American Politics, 2nd Edition. Chicago: University of Chicago Press. Students work on research projects with Professors Jones and Theirault. This course is a continuation of GOV 370M from the Fall Semester. Agenda-setting in policymaking is the process by which problems come to be addressed by decision-makers. This seminar will explore this process by examining the following topics: the connections between human decision-making and agenda-setting; models of the agenda-setting process; the role of the mass media; effects of political institutions on the setting of the agenda; and agenda-setting and policy change. This course will examine the politics and history of public policymaking in America. We will examine how policy is made, and whether LBJ’s dicta that "good policy is good politics” holds. We will study contemporary policy challenges, especially focusing on financial and budgetary challenges, health care, environment, and justice.